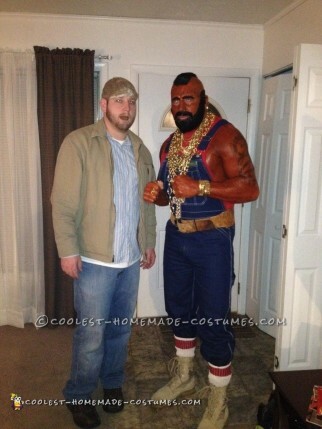 To make this Mr. T. Costume you’re gonna have to spend a couple hundred bucks unless you wanna look cheesy. If you have combat boots, coveralls, and 50 lbs of gold laying around, then it will be less. In my case I also had to go with liquid latex body paint being that I am a Caucasian male! This costume is definitely lots of fun and you’ll be the hit of the night.